Have you ever wondered what happens to your car after you turn the keys over to a valet? If you've ever found damage to your car after letting a valet park it, you know that it can be hours of phone calls before you get even the basic information you need to file a claim. Also you may find it difficult to prove that it was the valet who did the damage. Well folks who parked at the Hyatt Hotel in downtown St. Louis may have a very strong case to prove damage when someone calling himself "valet underground" posted dozens of videos on YouTube showing a valet doing donuts, peeling out, burning out, revving engines and spinning tires in expensive cars, in the parking garage about six months to a year ago. The general manager of the Hyatt hotel downtown confirmed to FOX 2 that it happened in his garage. Tire marks are still visible on the pavement. Hyatt fired the valet company. But how many video makers are out there catching valets doing damage to cars? Not many. So who's liable for damage a valet has done to your car and how do you collect on that claim? Liability varies from state to state, but in most cases the person driving the vehicle at the time it was damaged will be the one liable for the repairs. 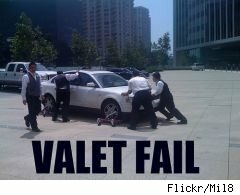 If that person is a professional valet, the responsibility would normally fall to the valet's employer. In most cases that employer will be a contractor that is operating the valet service for the hotel, mall, restaurant or other establishment at which you left your car. But getting the valet company to own up to the damage can be difficult. When I was a manager for a medical clinic we hired a valet company and regularly got complaints, some legitimate, some false. Your best bet is to do a quick inspection of your car when you pick it up and report any damage you see immediately, but even if you do, the valet may try to deny he did the damage. You'll probably find that the place you parked posts signs stating that they are not responsible for damage to your vehicle. They can do this because they've likely hired an independent company to handle the parking. When you see those signs it usually means the valet company is the one required to carry its own insurance and insure its employees against damage to the vehicles they park. So what you need to do is speak with the on-site manager of the valet company to get the phone number and address of their corporate office so you can speak to someone about filing a claim. Don't get nasty or you likely won't get the information you need. If the on-site manager won't give you the information then talk with manager of the establishment you visited. They can give you the information about the valet company responsible and key contact people. If the damage is severe, you may want to call and get a police report of the incident. If you find you are stonewalled, collect all the information you can including the name and address of the company you were visiting, the name and address of the valet company and the name and address of the specific driver whom you believe damaged your car. Then turn this information over to your own car insurance company and explain the full story to them. Your insurance company has many more resources at their disposal to find out who is liable and responsible for paying the damage to your car. If the damage is severe and you need to have the work done immediately, you can file a claim through your insurance company and let them collect it for you. But if you must do that, you will have to pay your deductible and hope the insurance company can collect that money for you. Lita Epstein has written more than 25 books including The Complete Idiot's Guide to Improving Your Credit Score and Surviving a Layoff: A Week-by-Week Guide to Getting Your Life Back Together.